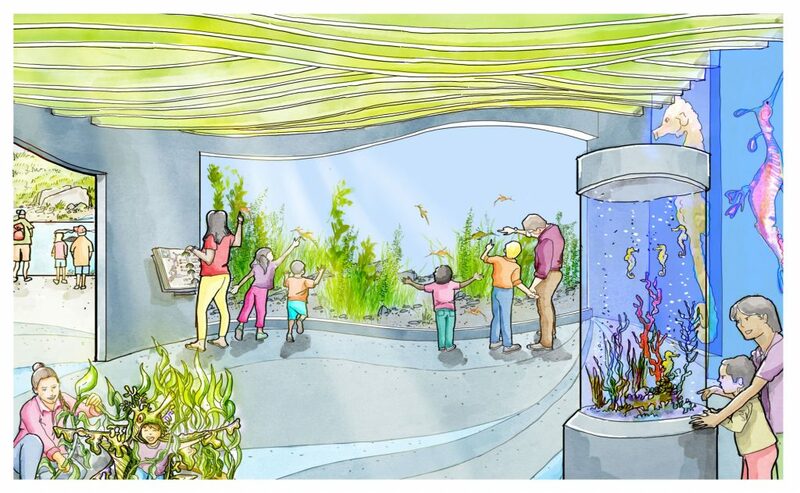 Artist rendering of the new seadragon and seahorse exhibition opening summer 2019. Next summer Birch Aquarium is launching a new permanent exhibition that brings seadragon conservation to the forefront. The exhibition, which has yet to be named, will be home to Weedy and Leafy Seadragons, as well as several species of seahorses and pipefish. The centerpiece of the exhibition will be one of the most expansive seadragon habitats in the world. The 18-foot-wide, 9-foot-tall exhibit will hold 5,375 gallons of water — thats 70 bathtubs! More than being a stunning display, the habitat has been designed to create the ideal environment to breed Leafy Seadragons, something that has never been done in captivity before. “We have had great success propagating seahorses for more than 20 years, but Leafy Seadragons have never been bred in an aquarium environment,” said Jennifer Nero Moffatt, the aquarium’s senior director of animal care, science and conservation. From an expanded seahorse nursery to a hands-on camouflage experience for young learners, and a sneak peek into the behind-the-scenes Seadragon Lab, the exhibition will immerse aquarium guests into the underwater lives of seahorses and seadragons, while giving them a peek into the work Birch Aquarium’s world-class Husbandry Team is doing to ensure that these species survive into the future. The husbandry of these species is increasingly vital due to the impacts of climate change, warming oceans, and illegal collection of wild populations, whose numbers are still widely unknown. Joining our partners in the Association of Zoos and Aquariums (AZA), Birch Aquarium’s seahorse and seadragon conservation efforts are part of the Species Survival Plan (SSP), a cooperatively managed program that oversees the population management of select species within AZA member institutions and enhances conservation of species in the wild. Each SSP Program coordinates the individual activities of participating member institutions through a variety of species conservation, research, husbandry, management, and educational initiatives. This exhibition is made possible by generous donations from our community. Additional opportunities to support this groundbreaking exhibition are still available. Those interested in giving may contact Katarina Trojnar at ktrojnar@ucsd.edu or (858) 534-1966. Slated to open shortly before Memorial Day, the new seadragon exhibition will replace The Infinity Cube installation, as well as There’s Something About Seahorses, which opened in 2009. It will be the fourth major exhibition Birch Aquarium has opened in three years and the largest indoor aquarium addition since the grand opening in 1992.